A multi-purpose mariner safety and motor housing arrangement for the secure enclosure of the lower drive unit of an inboard/outboard or outboard motor for a boat. The multi-purpose housing preferably comprises a left half housing and a right half housing hingedly connected along a front edge thereof. The left half housing and the right half housing are arranged to lockably enclose a lower drive unit of a motor. 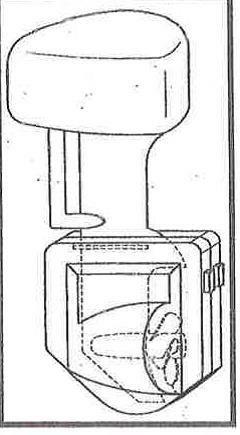 The housing arrangement encloses a plurality of accessible, watertight sub enclosures disposed within the left and the right half housings for safe containment of emergency gear therewithin, to provide floatation and safety to mariners even when the housing is removed from the motor. Illuminating florissant enclosure; Entering the harbor by boat will show the location of moored boats if entering the harbor during poor visibility or nightfall. Floatation Device; If lost, broken down,or lost at sea the device will be illuminated for rescue purpose. Locking Device; Anti-theft device in which no boat can be stolen. Protective Device; in the event that you boat is stored at any marine or on a trailer on your property it will protect your propeller from theft or damage and protect any other person from being hurt from the propeller being in oppositions way. Strobe light built in beacon for safety purposes; If you boat breaks down; runs out of fuel or you are simply lost will help any emergency responders locate you more effectively with a quicker response time during inclement weather or in case of any emergency while youre boating. Strobe Light; In the event the boat is being towed via trailer and become disabled the strobe light will act as a emergency light for protection of both the boat and trailer from being hit from oncoming traffic. Compartment doesnt allow sea grass or any other foreign matter from growing onto your lower unit where your water intake is located. I am looking for an outright sale or license with royaties . This product is derived from protected harbors and rivers being overcrowded because familys downsized from the less fuel efficient boats to a more economical sized boat. since the overcrowdedharbors and rivers in which boats are moored at are continuously moving with the tides it has created a situation where the outdrives or outboard motors of each boat swings into one another causing damage to the gel coat and the propellers of the offending boats. Having this product would elevate any grievances between any boat owner and Harbor Master once purchasing this product for any boat. The Manchester by the sea Harbor Master of Massachusetts has already mandated and madf this a By-Law stating that all boats moored in Manchester by the sea inner habors and rivers must have a protective device over the outdrive of each boat to qualify a boat to have a moring in the Manchester by the sea harbor. The boaters are using makeshift devices such as , Plastic rubbish containers, Plastic milk creates and even life vest to coverthe lower unit of the outboard motors to qualify for a mooring . 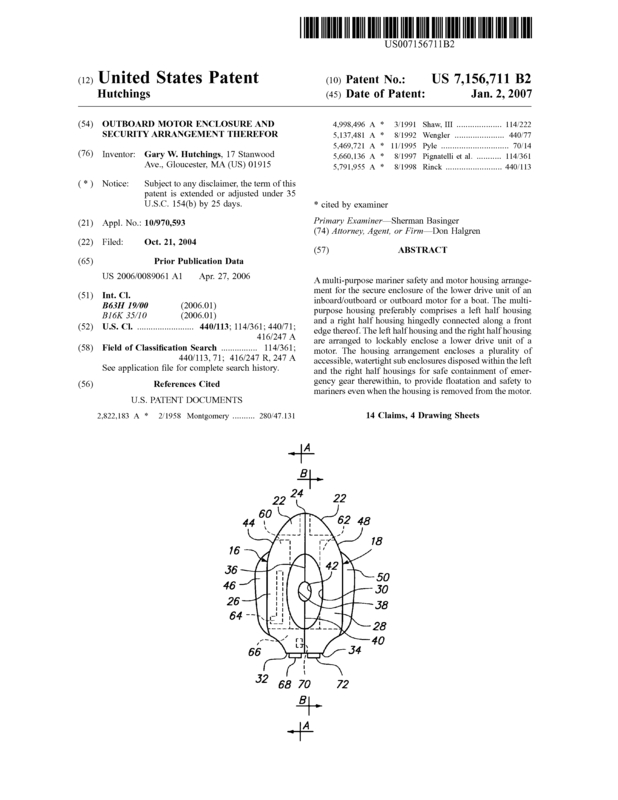 Page created at 2019-04-23 6:45:26, Patent Auction Time.